Allerton Removals and Storage- Furniture removal and storage, Northallerton, North Yorkshire- for house removal, office removal,single furniture items and any type of storage. Allerton Furniture Removal and Storage is the premier furniture removal and storage company based in North Yorkshire. As a professional well established family run business, we specialise in all types of furniture removal, and can accomodate you whether you are moving locally or overseas. We also offer extensive local storage in a secure and safe environment. At Allerton Furniture Removals and Storage, we know that any kind of a move, whether it be your home or business, can be a life changing event. We also know how stressful it can all be. Our dedicated team of packers and removers are all specialised in ensuring that every furniture removal is completed without stress and that everything on your moving day goes as smoothly as possible. We offer a complete range of services - from moving single items, to furniture removal for whole homes or businesses. Whether it be a simple move across town, or a full life change across the world, we are able to tailor our service to accomodate you, and ensure that this is all done at the best possible price. <More Details>. Every move requires a serious amount of organisation, and careful packing of your furniture and belongings. With this in mind Allerton Furniture Removal and Storage provides a full range of tailored packing services. We have a helpful guide, available for download, which contains our best advice, for packing your furniture and belongings as safely and easily as possible. We are able to provide packing equipment including all the packing boxes and materials you may need. Alternatively we are able to pack your home and furniture for you, with our full team of professional packers who will come to your home or business and pack the entire contents, while you sit back and relax. <More Details>. Whether you are looking for long term storage, or a short term storage solution, Allerton Furniture Removals and Storage has the storage solution for you. We have a local storage facility based in Northallerton, North Yorkshire, which is clean, well maintained and extremely secure, and we offer flexible payment fees making this an extremely cost effective way of storing your goods. <More Details>. 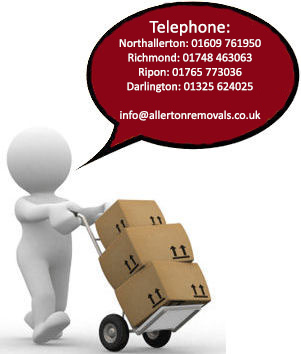 "Allerton Removals were very professional and extremely helpful when we had to move out of our shop on the High street , not only did they move us- but they stored our things until our new shop was available. Allerton removals offered us a free collection & delivery service and a free 10 foot storage container for 6 months as a way of a donation for the 'Save the children' charity. I cant thank them enough for all that they did to make everything go smoothly." "Friendly people , hard working and skilled at what they do. Thoroughly pleased with the service we received and value for money." Thanks - Andrew. For any kind of furniture removal or storage requirement -call or email us now for a free NO OBLIGATION estimate. Packing is the most essential part of making sure any furniture removal or storage goes smoothly. <Click here> for our free top tips and guide to packing. Dont just take our word for it -See for yourself what our customers have to say about us!